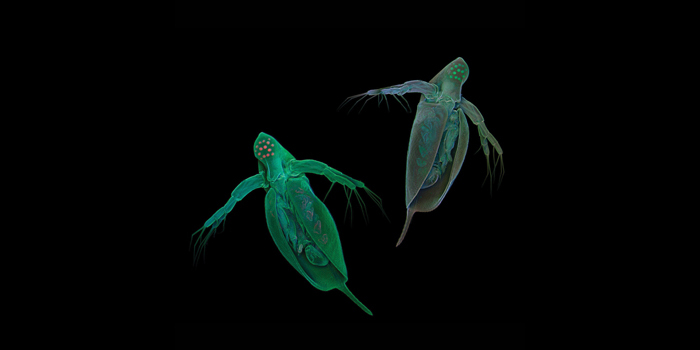 Common water fleas (Daphnia pulex) visualized by means of confocal laser scanning microscopy. Micrographs: Jan Michels, Christian-Albrechts-Universität zu Kiel, Germany. See Maruki and Lynch 2017 and Ye et al. 2017 and and Ackerman et al. 2017 and Lynch et al. 2017. After 60 years of mystery, researchers have identified the pathogen responsible for White Fat Cell Disease. Water fleas of the genus Daphnia have long been critical tools for studying the ecology and evolution of host-pathogen interactions, but one of their natural pathogens has remained mysterious for more than six decades. 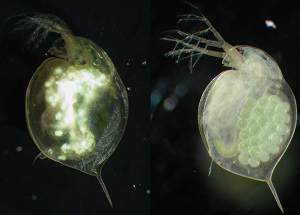 In the 1950s, Daphnia magna isolated from rock pools in southwestern Finland were reported to suffer from a disease that obscured the normally semi-transparent animals with extremely large, white fat cells, giving them a greenish, iridescent shine. This highly infectious disease, called White Fat Cell Disease (WFCD), was also reported in water flea populations across Europe and Asia. Although bacteria were assumed to be the cause, no specific bacteria was ever linked to the disease. In a report published in G3: Genes|Genomes|Genetics, Toenshoff et al. have finally unmasked the culprit behind WFCD: an iridovirus that they named Daphnia iridescent virus 1 (DIV-1). Iridoviruses are common invertebrate pathogens, and interestingly, another Daphnia-infecting iridovirus was previously reported to cause symptoms similar to WFCD—but until now, the two had never been linked. D. magna infected with DIV-1 (left) and uninfected (right). After confirming DIV-1 as the causative agent of WFCD, Toenshoff et al. sequenced its genome to gain a better understanding of its evolutionary origin. DIV-1 has some genes in common with other iridoviruses, including a set of core genes related to infection and replication in the host. Although these similarities remain, a number of differences suggest that DIV-1 diverged from other invertebrate iridoviruses so long ago that it has no close relatives that are known. Interestingly, DIV-1 also has a number of genes likely obtained through horizontal gene transfer with its water flea hosts—including genes that might inhibit apoptosis in its host’s cells. DIV-1 is the first viral Daphnia pathogen to be characterized. The virus is both widespread in the wild and easily cultured, so its identification reveals it as a useful new tool for exploring the ecology of viral infections in these classic model hosts.